Note: This is a completely unfinished recipe. I know what it should be, and I'll be getting around to it one of these days. This recipe came about on accident, but it really turned out nicely. 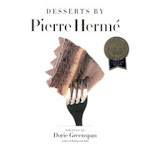 I was making cookies invented by Pierre Herme, my favorite dessert chef. But I was making the cookies with Emily under my left arm, as she was being so much trouble, and was into absolutely everything - dragging chairs about, sticking her hands into whatever she could get her hands on. It was for a Tuesday with Dorie project. I got the dough made, and the rolled it into two rolls like I was supposed to, and put it into the refrigerator to chill for 3 hours. Well eventually, not necessarily that day, I got one of the rolls out to slice up and cook. All the dough would do was crumple. I eventually cooked up a few very crumbled up bits, but I was quite discouraged, and left the rest of the dough sitting on the cutting board. Eventually daughter #1 and her son Christian showed up and they made light work of that remaining dough. Well the next day while thinking about the cookie dough problem it struck me that I better look at the recipe. Well sure enough I had omited 1/3 of the needed butter. At that I didn't give the dough any more thought. On the following Wednesday Riley had requested that I arrange to have a small dessert soiree for our house group. It was all a bit overwhealming to me, but I began by making up the batter for a chocolate cake, putting part into mini cupcakes, and the rest into a five inch springform pan. Next I thought maybe I would make a pear tart, and I went to the refrigerator to find the needed ingredients. There, on top of the egg carton, was the remaining chocolate cookie dough, and immediately I decided to use it for the crust of the pear tart. I turned on the oven, selected a tart dish, and the put the dough into the cuisanart, and processed it into a crumbly mixture and poured it into the tart dish, smoothed it out, patted it down, and put it into the oven for about 12 minutes.